Section 25 have been forever trapped- between austere Factory cultishness and the actual thrust of this amazing, other music. 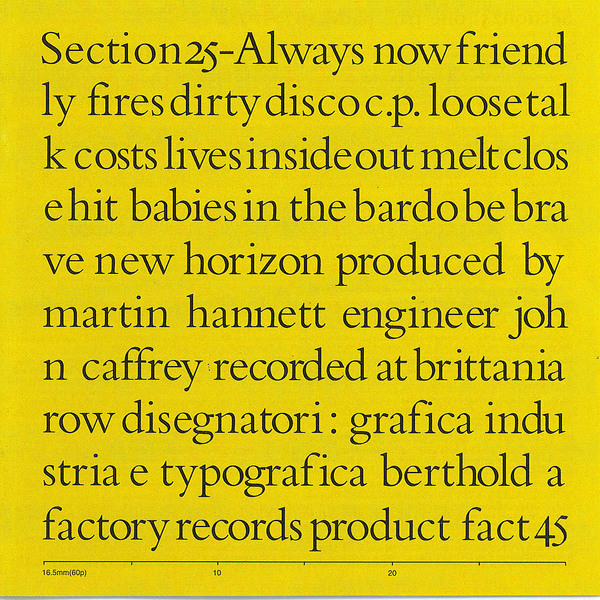 Encouraged by Ian Curtis and Rob Gretton, Blackpool's Section 25 (comprising brothers Larry and Vin Cassidy and Paul Wiggin), entered the studio in autumn 1979 and cut tracks for their debut single for Factory Records. 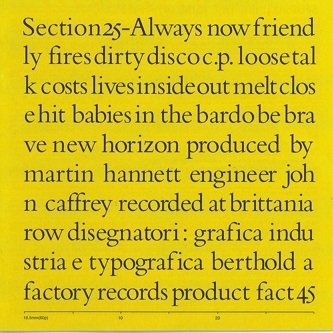 Predictable Joy Division comparisons notwithstanding, Section 25 were castigated for perceived similarities to P.I.L. 's then-new dub-heavy sound, despite recording the tracks two months earlier than ‘Metal Box’. Undaunted, the band set about recording the follow-up with Martin Hannett, who understood their inherent ambiance and effectively translated them in the studio. Subsequently, Factory passed on the brilliant "Charnal Ground/Haunted" single and farmed the tracks and the the next single out to their European satellite, Factory Benelux. Roughly one-third improvised, ‘Always Now’ has a sound closer to a Can hybrid, but no one wanted to notice.